There are two ways to take payment on Selz. Depending on the country you are in, you can use our built-in payment gateway Selz Pay or use PayPal as your payment gateway. 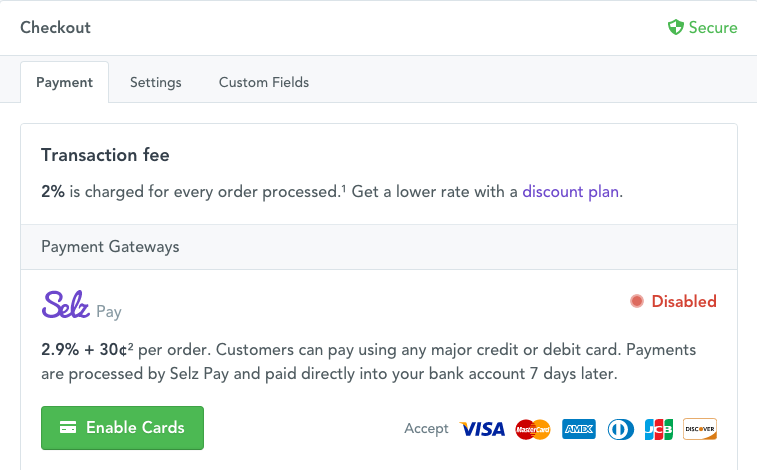 If you are using Selz Pay as your payment gateway and have payments enabled on your Selz account, you'll get paid daily, weekly, or monthly for your credit card sales into your chosen bank account. All Selz Pay transfers will display as 'Selz' on your bank descriptor. Please read below to learn more about your transfer schedule, so you know when to expect payment for your orders. You can choose your transfer schedule on Selz: Daily, Weekly, or Monthly. Daily: Every day, we'll bundle your orders for the day and deposit them in your bank account 7 business days later. The very first transfer Selz Pay makes to your bank will take 7 days to post in the US or Canada. Weekly: Once a week, all available orders will be deposited in your account. Your available orders will include orders placed up to 7 business days prior to deposit date. For example, if your deposit day is Thursday, all orders received between Wednesday and Tuesday will be deposited on the Thursday 7 business days later. The very first transfer Selz Pay makes to your bank will take 7 days to post in the US or Canada. Monthly: Every month, all available orders will be deposited in your account on the 1st day of the month. Your available orders will include payments made up to 7 business days prior to deposit date. The very first transfer Selz Pay makes to your bank will take 7 days to post in the US or Canada. Daily: Every day, we'll bundle your orders for the day and deposit them in your bank account 7 days later. The very first transfer Selz Pay makes to your bank can take up to 10 days to post outside of the US or Canada. Weekly: Once a week, all available orders will be deposited in your account. Your available orders will include orders placed up to 7 business days prior to deposit date. For example, if your deposit day is Thursday, all orders received between Wednesday and Tuesday will be deposited on the Thursday 7 business days later. The very first transfer Selz Pay makes to your bank can take up to 10 days to post outside of the US or Canada. Monthly: Every month, all available orders will be deposited in your account on the 1st day of the month. Your available orders will include payments made up to 7 business days prior to deposit date. The very first transfer Selz Pay makes to your bank can take up to 10 days to post outside of the US or Canada. You can always change your transfer schedule if needed. Our payment processor for Selz Pay needs to treat every seller's first transfer differently from subsequent transfers. They wait seven days after your first successful charge before sending the first electronic transfer to your bank account. Delaying your first transfer for a few extra days allows them to address some of the risks that are inherent in providing credit services to our sellers. You can always check your previous transfers from your Selz Dashboard > Statement. Log into your Selz account. Click on Settings > Checkout and follow the steps to Enable Cards. Before filling out the forms, you may want to read about Getting approved to sell on Selz. Fill out the verification details form and submit. Lastly, we'll perform a quick check that your products don't breach our terms and you'll be good to go! You can take PayPal payments and also process credit cards through your PayPal account if you are on the Standard or Pro plan as well as during your 14-day trial. If you have the PayPal enabled on your store and a customer chooses to purchase your product through PayPal, those funds are deposited immediately into your chosen PayPal account. Click Settings > Checkout and enable PayPal. You'll then be asked to log into your PayPal account and authorize us to pay you into that account for any Selz orders paid with PayPal. I'm located in a country where enabling cards is available. Can I use PayPal exclusively? If you choose, your store can take PayPal as a payment option exclusively, even if you're located in a country where Selz Pay is an option. What currencies can I process with PayPal? To see a list of currencies that can be processed by PayPal see our guide. My PayPal account is currently disabled and Selz Pay isn't available in my country. What do I do? If there is a specific payment gateway you'd like to see on Selz, please contact us.